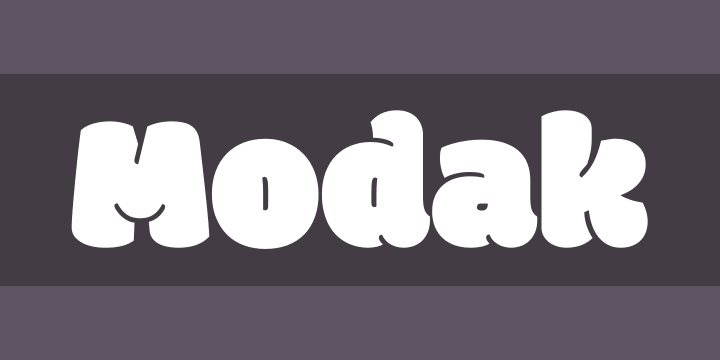 Modak is a sweet plump Devanagari+Latin display typeface with portly curves and thin counters. It is Unicode compliant and is open sourced under the SIL Open Font License v1.1. It began as a heavy hand-sketched letterform exploration in Devanagari with cute, adorable characters whose curves merged into each other, forming distinct counter shapes. As we translated these into a functional font, each character was fine-tuned and multiple matras designed to match precisely with every character. Unlike the conventional approach the post-base matras in Modak overlap the consonants. Likewise overlapping ukars were also designed leaving thin counters in between. Rather than being a mere composite of 2 separate glyphs, every conjunct was redrawn as a single entity. The challenge was to maintain legibility and consistency in the thin counter spaces across all characters, irrespective of their structural complexity. The resulting typeface is one of its kind and most likely the chubbiest Devanagari typeface to be designed so far. Modak Devanagari is designed by Sarang Kulkarni and Maithili Shingre and Modak Latin by Noopur Datye with font engineering by Girish Dalvi. This project is led by Ek Type, a collective of type designers based in Mumbai focused on designing contemporary Indian typefaces. We are immensely thankful to Santosh Kshirsagar, Pradnya Naik, Yashodeep Gholap and Dave Crossland for their suggestions and feedback during the font design process. We are also grateful to our friends from the Industrial Design Centre, IIT Bombay and Sir J J Institute of Applied Art for their support and encouragement.